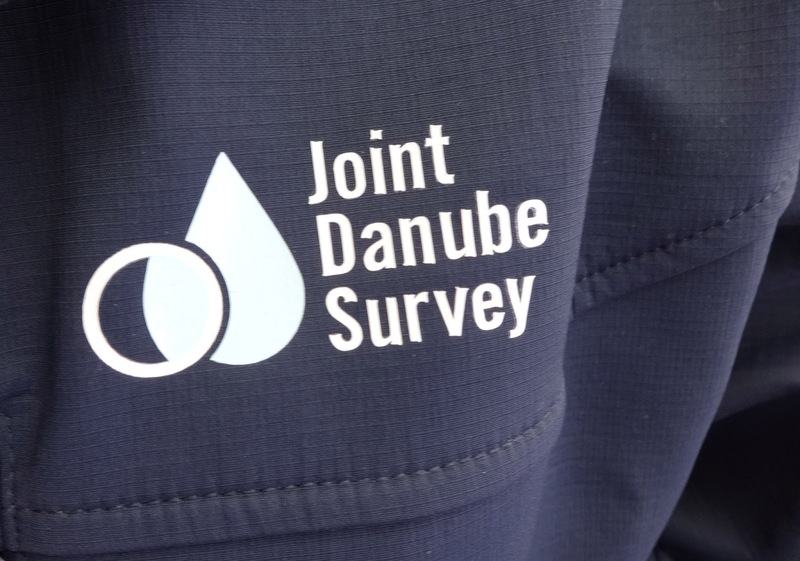 I got the opportunity to join the 3rd Joint Danube Survey (JDS3) for one day almost in the last minute from Béla Csányi, leader of the core team. This was going to be a freat chance to experience altt the samplong and preparation that is going on board of the two ships, Istros and Argus. The expedtition took off from Regensburg, Germany twoo weeks ago, and after an unscheduled stop at Göd (two of the hungarian members are from this town) we were taken to the ships at seven in the morning. The destination was the Deák Ferenc bridge downstream Budapest, which was the 22nd sampling site out of the total 68. 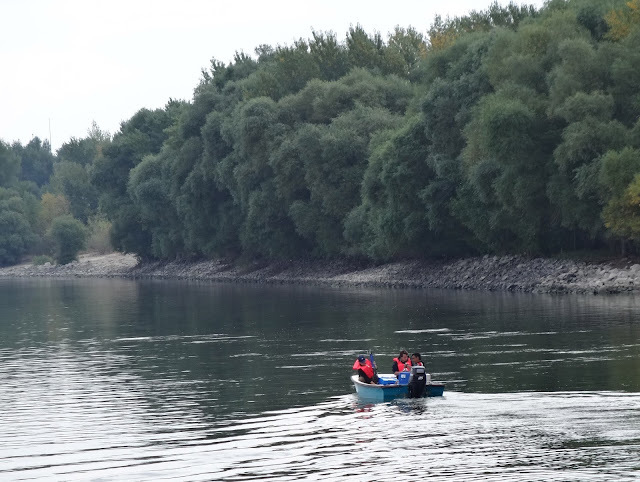 Two other persons joined the expedition at Göd, they both were employees of a hungarian state office of the Middle Danube Valley. 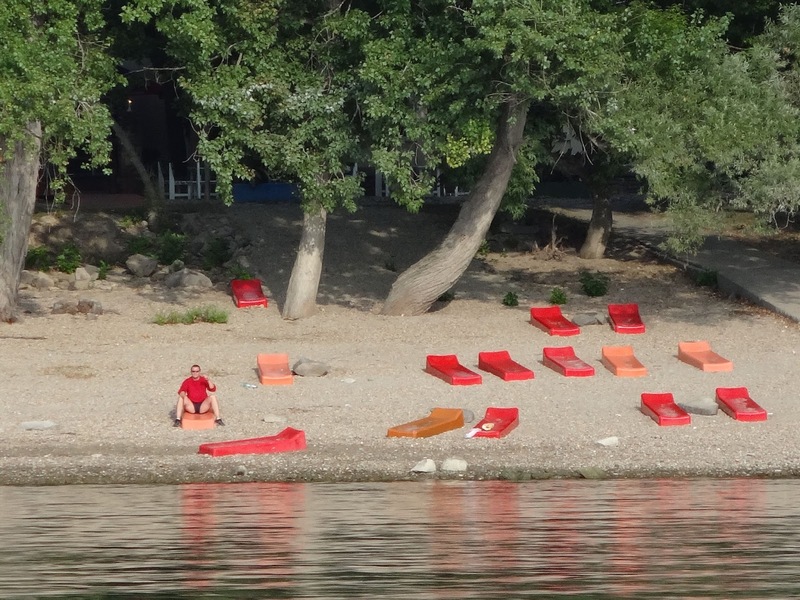 We all took a motorboat to the Istros, where breakfast was served. 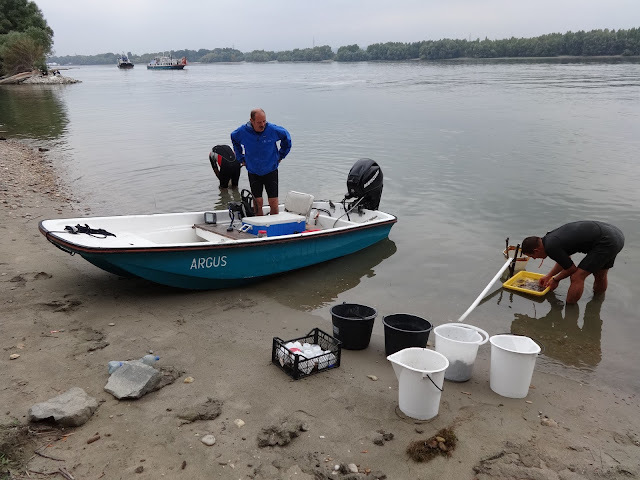 While Istros, a ship from the Romanian town os Constanta was responsible for the comfort (food and board), Argus, hometown Beograd, Serbia hosted the laboratories and research work for the scientists. Istros has a Romanian, Argus has Serbian captain and crew. 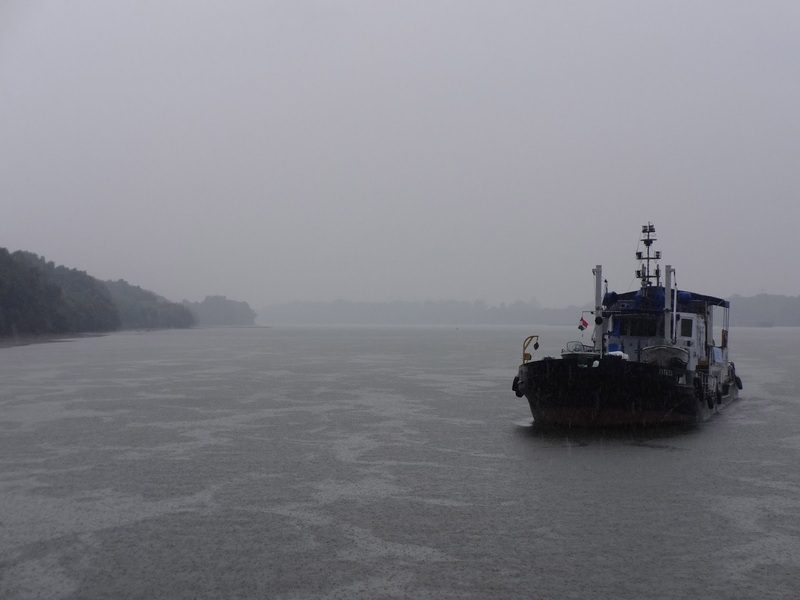 Unfortunately the Széchenyi icebreaker, which took part both of the previous journeys did not participated in this expedition. 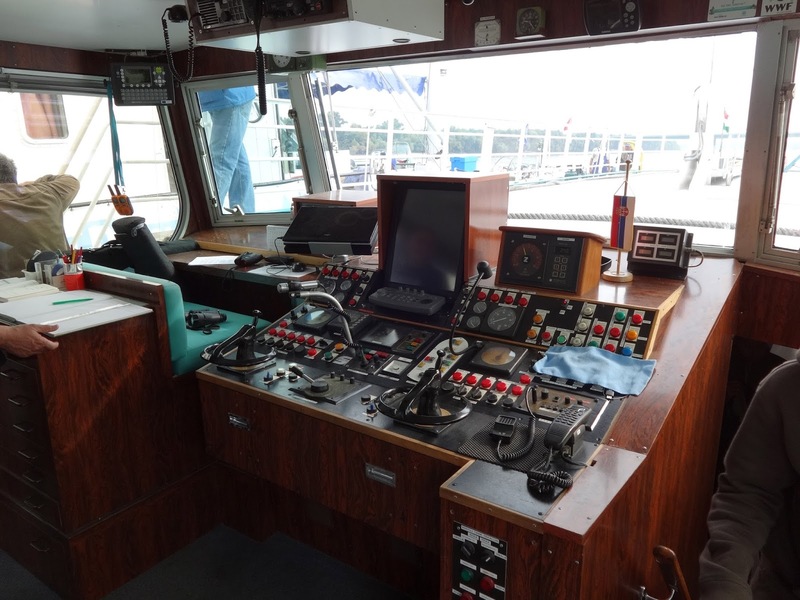 We received news from the two other fishing ships, that they are following us with a 60 kilometer delay. They were working near Szob this time. 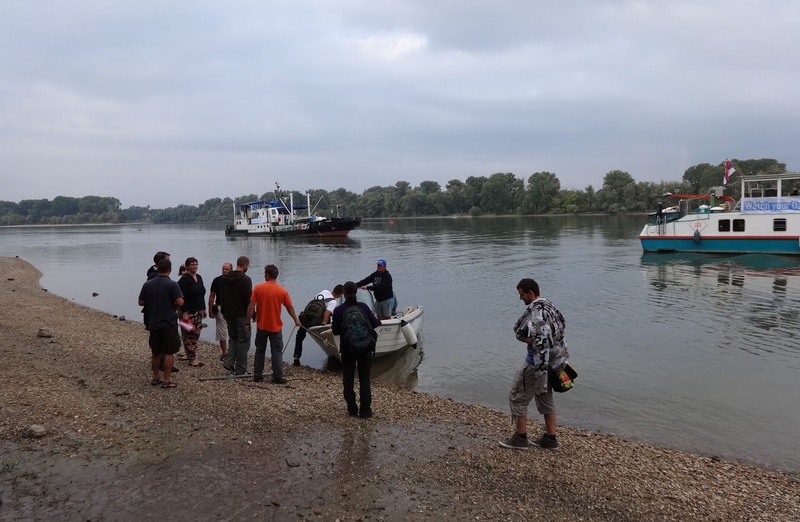 Night fishing caused this delay, but hopefully they can catch up on the Public Event in Budapest. 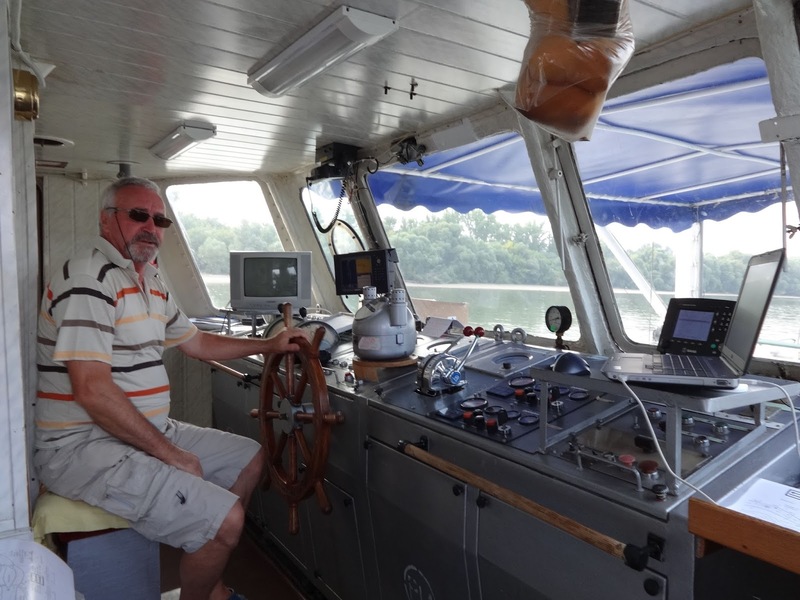 The bridge of Istros with the captain, who loves being photographed. The command platform of Argus. 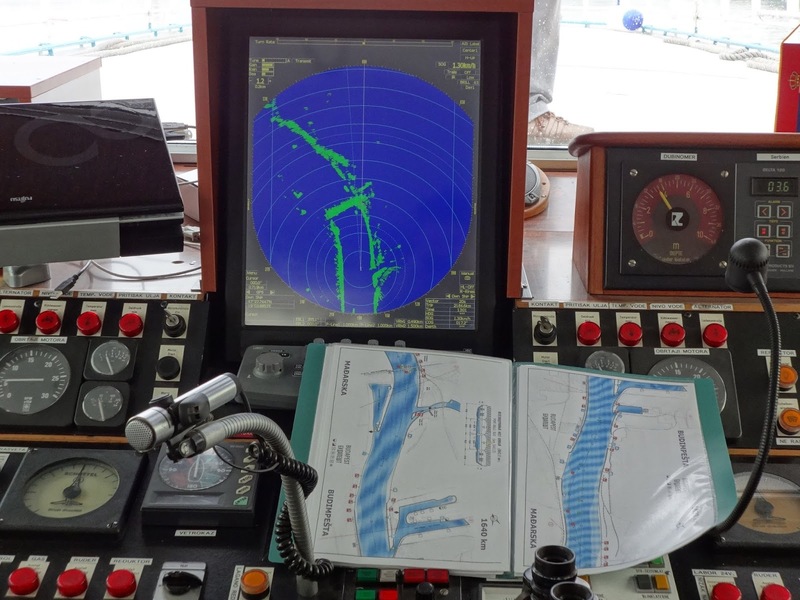 Radar view of the Lágymányos bridge near the Kvassay lock, south Budapest. 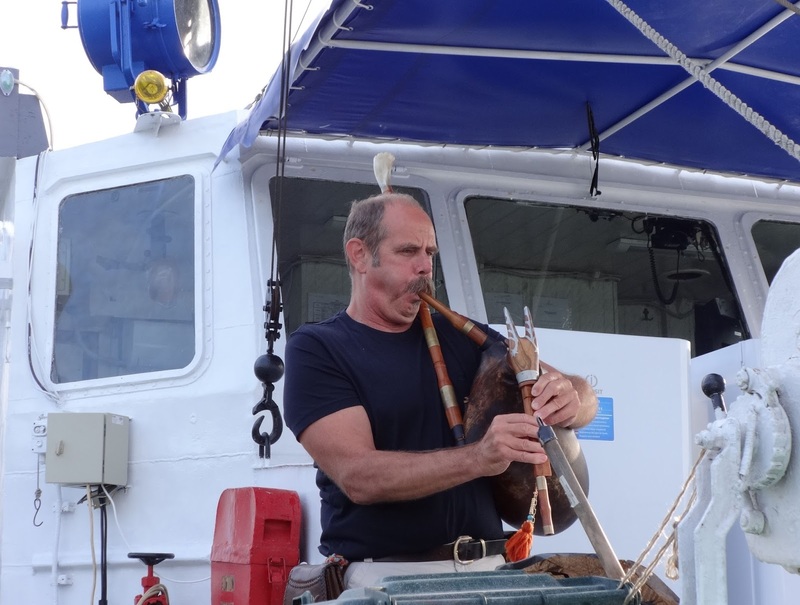 Béla Csányi, leader of the JDS3 core team loves to play his pipes in his spare time while we were heading towards Budapest. 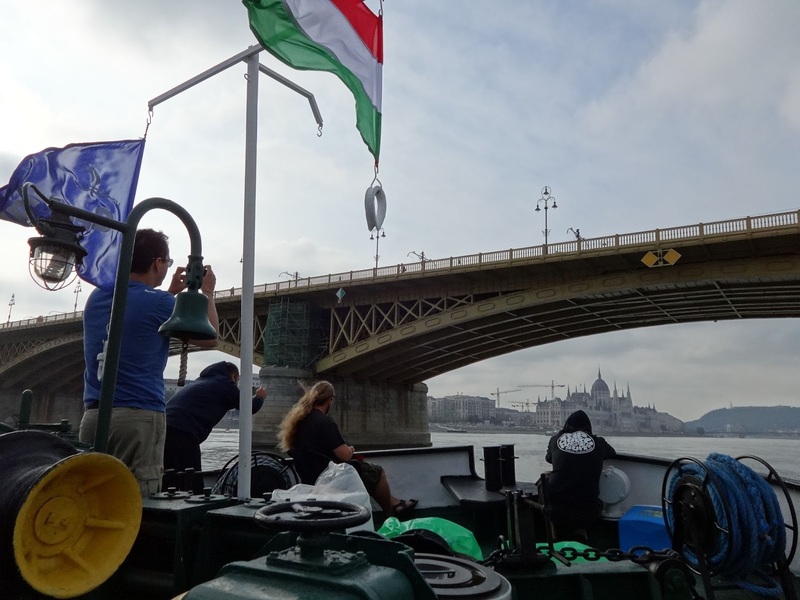 We sailed through Budapest without stopping, with an average speed of 20-22 km/hour. The Argus was the faster ship, so it was ahead of us two kilometers. Meanwhile the international team photographed the Hungarian capital. Although the sun was shining, almost everyone worn their official windbreaker with the JDS3 logo on it (see the first picture). Core team leader Béla Csányi was not only familiar with hidrobiology and music, but he was also a tourist-guide for the foreigners. He told a tale of history of almost every interesting sight. Not only István Széchenyi was mentioned in connection with the famous Chain bridge, but the music ship A38 also. 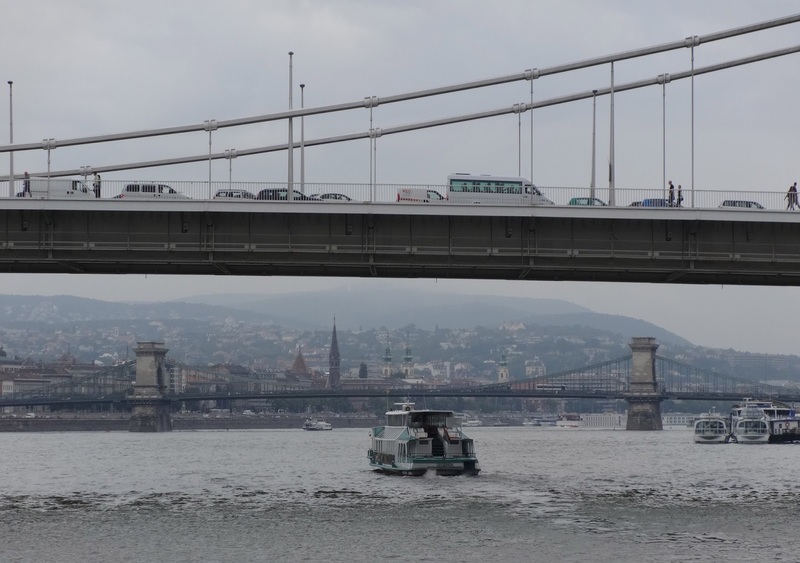 Downstream Budapest and the almost unknown Deák Ferenc bridge, the two ships slowed down and turned upstream. This meant we have arrived to our sampling site, next to the Kis-Háros Island (sampling code 22. river kilometer 1620). They do usually 2 sampling sites a day, today it was the only one, but sometimes it can be 3, which may finish after twilight. And the next day the crew must be up at 4.30 A.M. (for those lucky ones who slept on the ship it is 5.30 A.M.) no matter when they fell asleep. Argus and Istros navigated next to each other, so the scientist could make their way to Argus without usiing motorboats. Those who are responsible for the hidromorphology stayed on Istros, but soon they embarked into a motorboat. This sampling site is very important, because 6 years ago (JDS2) the Csepel sewage works was not finished. The plume of the sevage works enters the Danube on the middle of the river just 8-9 kilometers upstream. This plume is not crystal clear water, so it can be traceb by biological and chemical parameters. At one sampling site they almost use the same sampling pattern. They not only do one samplig but at least three. Those who do macrozoobenthos sampling, use 7 sampling points at one site including the riverbank area. So it is possible that the plume will be visible due to the many sampling points. The researchers found their places quickly on the Argus, it seemed they had done this many times before. Some of the samples are prepared here in this laboratory and in some cases the analysis too. The methods are so much specialised, most of the researchers are not aware what their neighbors do. Perhaps it is because of the nearby laboratory, we saw many chemical materials on the tables of the stern. 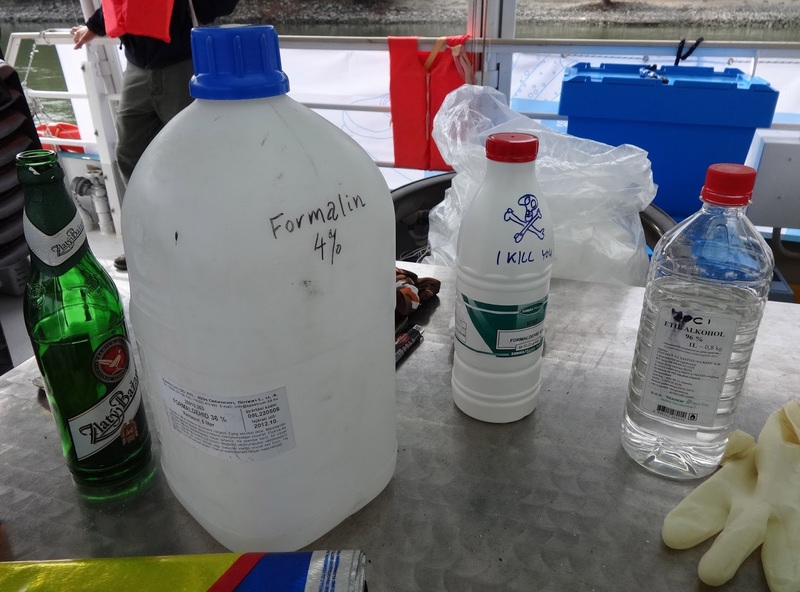 Alcohol, formalin, formaldehid and ethil alcohol. They are for the perservation of the samples, but in some cases they only freeze the samples. Therefore can we see 3 refrigerators in front of the bridge of Argus. 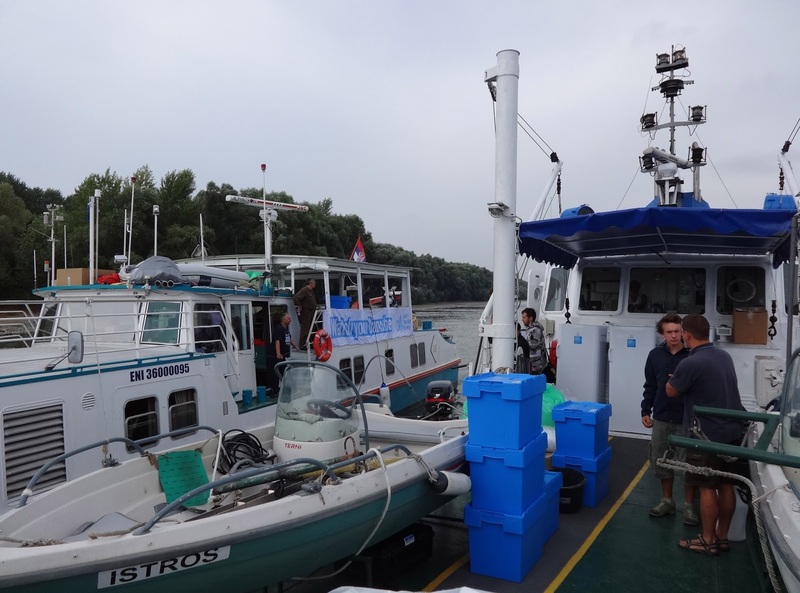 The samples are transferred every three days to Bratislava and Vienna by vans. 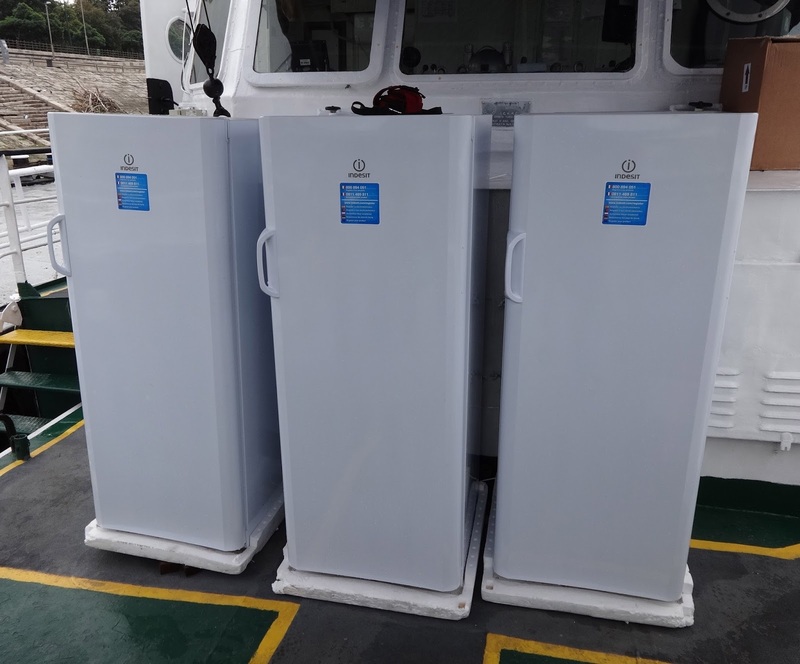 From these main storages will they be distributed to many participating European institutes and laboratories from Rome to Oslo, and from Germany to Croatia. Water samples are being filtered through these devices. Three filters are needed, because there are 3 sampling points at each site; left, right and middle. Whatever remained on this filter is going to be frozen in the refrigerators. Slowly the deck became empty, everyone went to do their duties. One team was transferred to the river banks, where they have to cover the area within 3 kilometers distance. They have gumboots, which covers all of their body and nets to capure living creatures. When they have finished they were taken to the other side of the Danube. 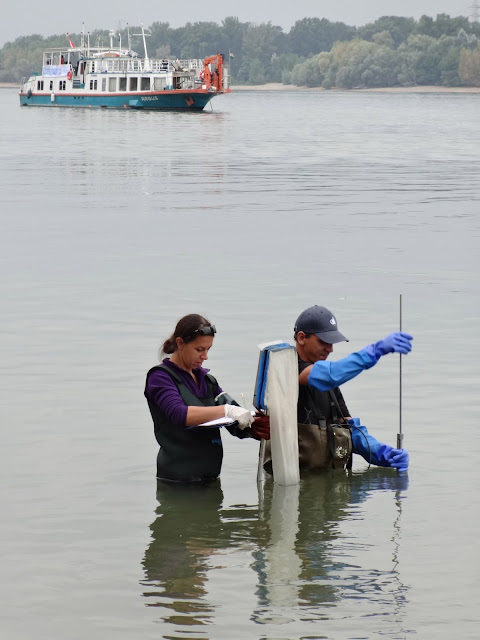 The macrozoobenthos team had the most time-consuming sampling work to do, due to the 7 sampling points. 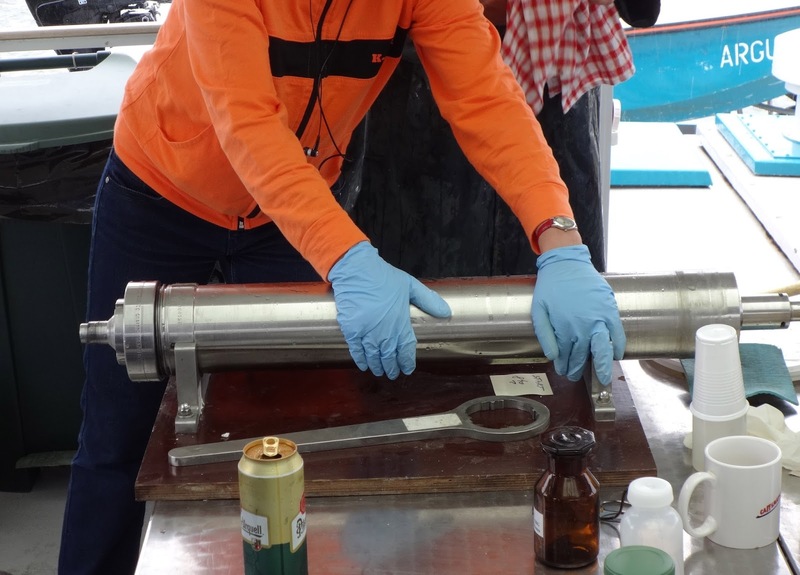 They dredged the sediments five times in the Kis-Háros Island segment with the tool on the below picture. Quite often bigger stones can deformate the dogteeth of the tool. 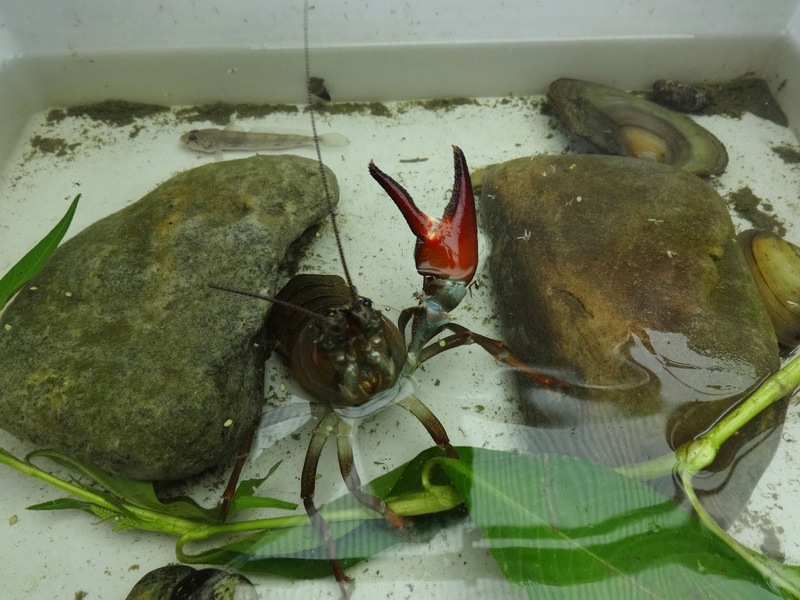 While dredging the bottom of the river they happened to capture a Signal crayfish (Pacifascatus leniusculus) on the Austrian Danube. Near Kolozsnéma, in the middle sampling point Ephoron virgo larvae was found, which was quite unusual place for them. Besides the macrozoobenthon phytoplankton sampling is also part of the expedition's main tasks. 20 liters of water needed for the little test-tube to fill, then it is put in the carefully labelled plastic container. Meanwhile the macrozoobenthos team started to wash out the living creatures of the five bucket sediment. It is a reverse panning, this time not the most dense material (gold) is the best, but the least dense. By shaking the sediments in the bucket, plentiful water is needed to wash the creatures into the net. 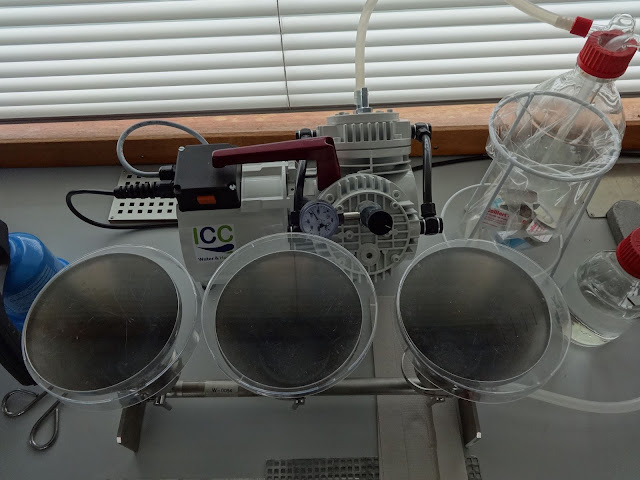 When a bucket is done, the sample is put into a white plastic container. 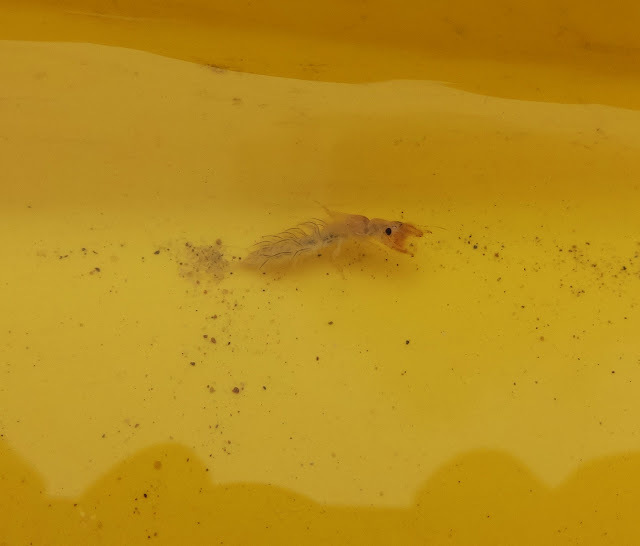 In the fifth sample, taken from the Kis-Háros Island shallow waters, an interesting insect was found. 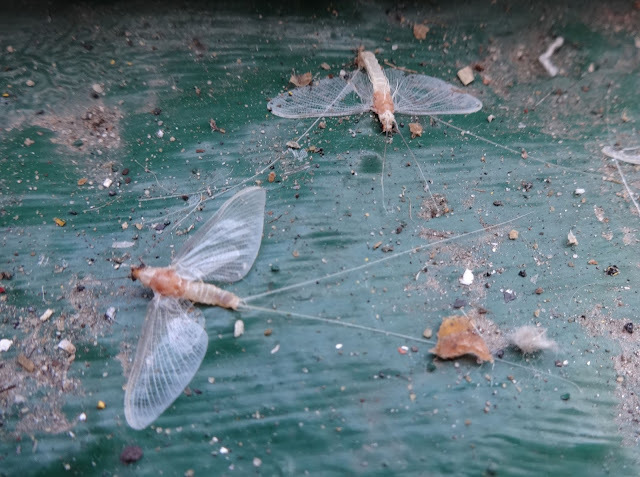 From this oilly, muddy grunge a living Epheron virgo larvae was stumbled upon. This sediment was literally olily, when the bucket was pushed underwater, a rainbow-colored fluid came to the river surface. It is often heard swarming Epheron virgo is an evidence of the clean river. And now, form this disgusting oily crap a living larvae was found. Recently swarmed Epheron virgo insects could be found anywhere on the decks, together with their yolk fallen in the wrong place. Maybe this is the most appropriate picture to illustrate the daily work of the researchers. 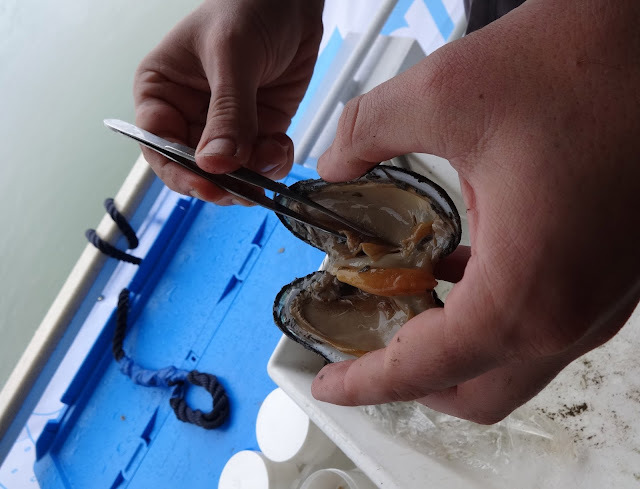 Already on the deck, a Serbian researcher is cutting out mussels gill, then put into a small test-tube. He's opinion: mussels are the most amazing creatures on the world. One of the most important sampling of the JDS3 - if not the most important - is the suspended solids sampling. 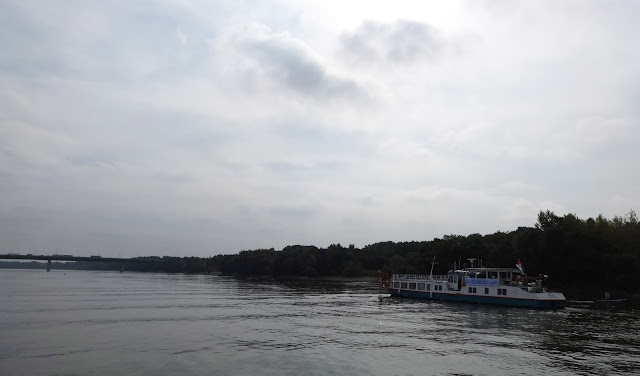 On the front deck and as well on the stern there is an approximately 600 liter capacity container, in which Danube water is being pumped. 20 liters/minute for about 4 hours, this means circa 5000 liters alltogether. In the container there is a metal roll, spining with 27000 rev. On the inner teflon surface the suspended solids precipitate. When the 4 hours expire, the metal roll is taken out. 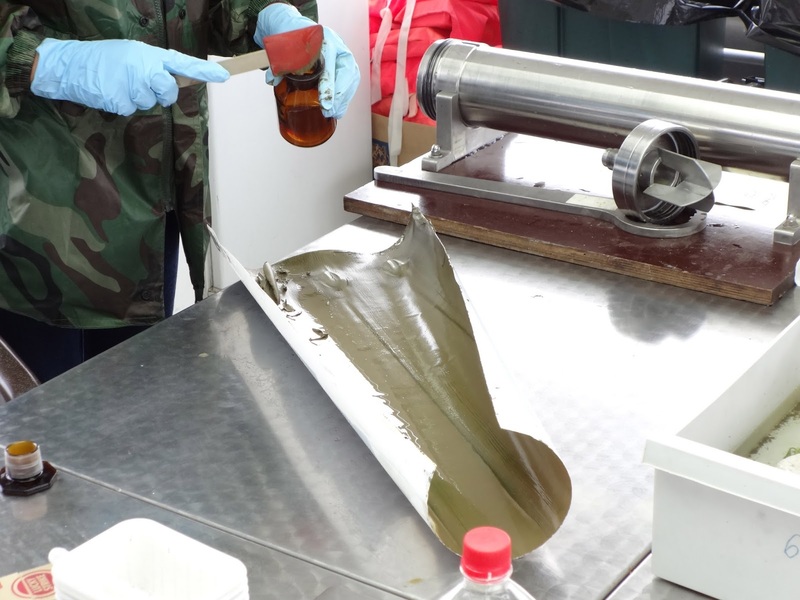 In the gathered clay-like sediment participating laboratories will test 360 substances. Including not only medicine leftovers and organic pollutant compounds, but their constituens which are fragmented by waves, solar radiation, or chemical processes. And thereby we will receive answers to the question if it is true thet the Danube is severely polluted with hormones coming from birth control products and medicine. 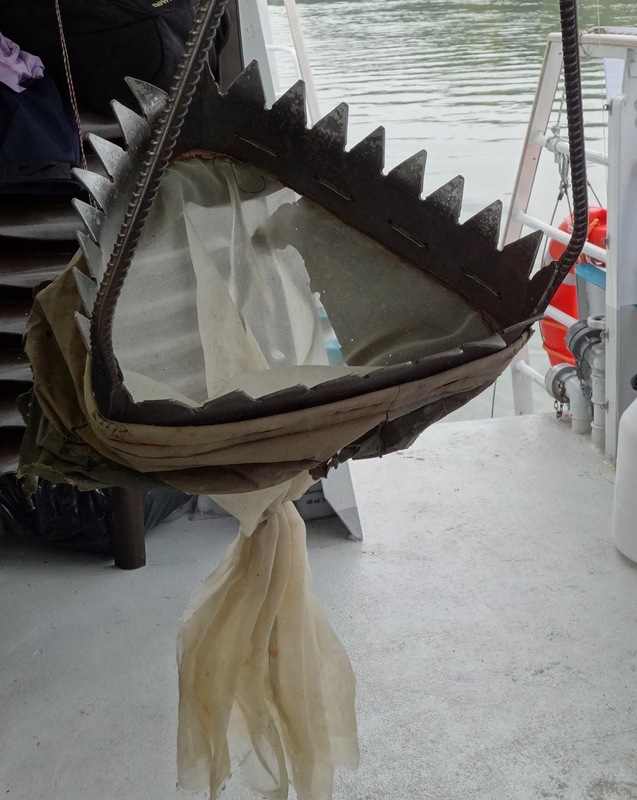 During the sampling it began to rain, which has developed into a major downpour by the time the last boat was lifted on the deck. This is how the Istros looked from the Argus. It was still raining when we arrived back to Budapest. 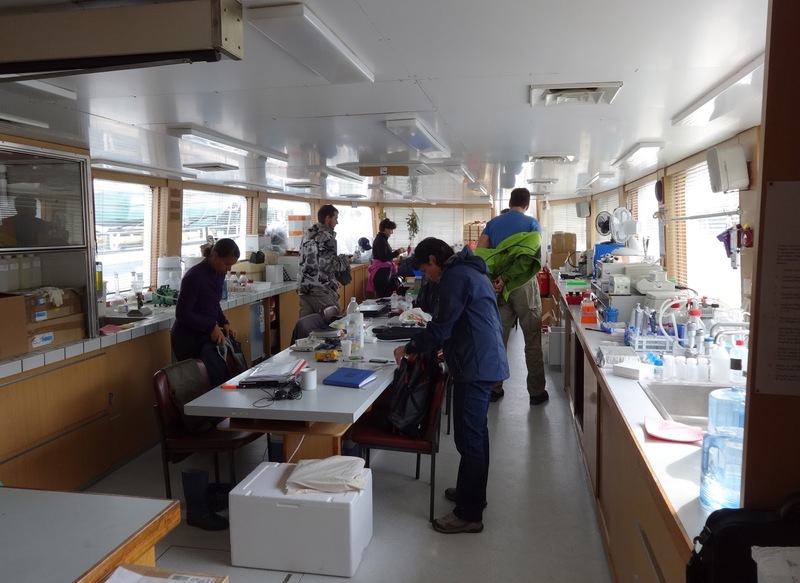 The researchers will overnight here, some will rest on board some in hotels, after this busy day. And the next day, after they had a good night's rest the will be able to answer all the questions they will get on the Public event. 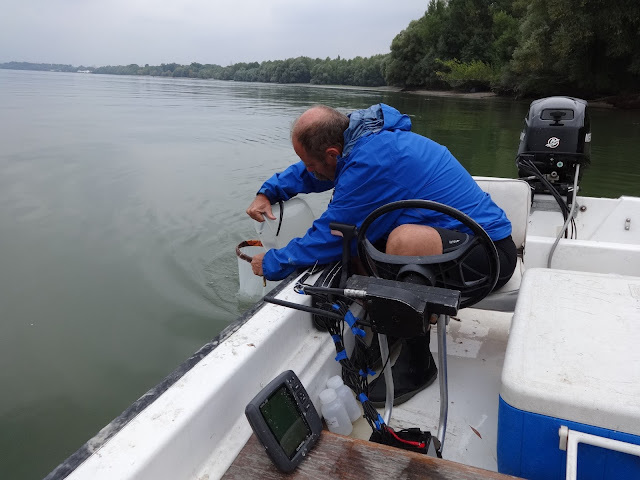 The 3rd Danube expedition was only mentioned on the hungarian version of this blog, and in an article of the Hungarian Academy of Sciences. 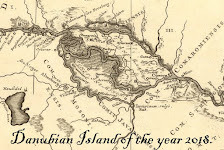 Hopefully the Public event will attract more attention to the expedition. 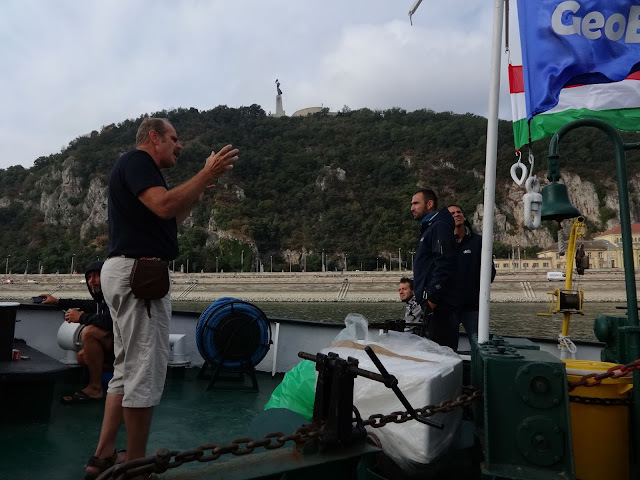 I would like to say than you to Béla Csányi and József Szekeres, for letting me be a member of the expedition for one day, as well to the crew and members for the plenty information!